Torreya taxifolia is one of the rarest conifers in the world. The species was once a prominent tree in ravine forests along the Apalachicola River through the Florida panhandle in North America. Since the 1950s, all T. taxifolia trees of reproductive age have died leaving only the remaining seedlings in the forest, a population approximately 0.3% of its original size. The current population is estimated to be between 500 and 600 trees. The ultimate cause of this catastrophic decline is still unexplained but this species has been subjected to changes in hydrology, forest structure, heavy browsing by deer, and most significantly a stem canker disease resulting in dieback. Plant pathology research has identified the disease causing agent as a new species of Fusarium torrayae and research is ongoing. T. taxifolia was listed as federally endangered in 1984 under the U.S. Endangered Species Act, and efforts have been made since to re-establish this species in its natural habitat. However, in situ preservation appears unlikely as plantings are susceptible to infection and as yet, no naturally resistant clones have been identified. Field surveys have found that stem damage from deer antler rubbing is a significant source of stress in addition to disease. Any future reintroductions will therefore need caging to protect the new trees from damage. Until damage from deer and stem canker can be controlled, recovery of the species is dependent on ex situ conservation efforts. The biggest challenge with ex situ conservation is the inability to use conventional seed storage techniques as the seeds are recalcitrant and cannot be dried for storage in freezers. Atlanta Botanical Garden in the USA has been leading conservation efforts for this species for more than 20 years. Their work includes tissue culture research and a feasibility study to identify if assisted migration to habitats free from deer and disease is a suitable measure to save this species from extinction. 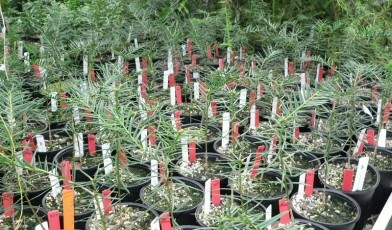 Read more about their work in our Global Survey of Ex situ Conifer Collections. Bedgebury Pinetum is one of many sites in the British Isles that is working with the International Conifer Conservation Programme to help cultivate this species. Aoki, T., Smith, J.A., Mount, L.L., Geiser, D.M., O’Donnell, K. (2012). Fusarium torreyae sp. nov., a pathogen causing canker disease of Florida torreya (Torreya taxifolia), a Critically Endangered conifer restricted to northern Florida and southwestern Georgia. In Mycologia. 105 (2): 312-9. There are more than 500 different oak species in the world. Find out about our work to protect the world’s most threatened oaks.